Widewater is a landlocked brackish lagoon approximately 1066 metres long and 90 metres at its widest point when the lagoon is in flood. 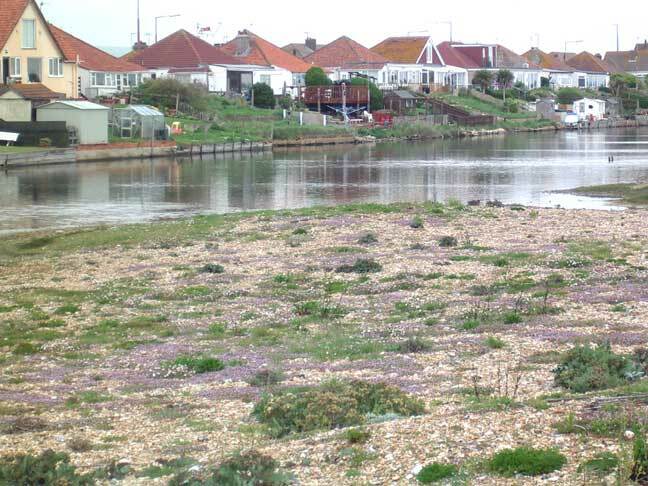 It was created by Man from the original Adur estuary after been landlocked by longshore drift and violent storms. The waters are replenished by the sea, which filters up through the basin of the lagoon on very high tides, and also by rain water. There is a dramatic rise in the level after heavy rainfall, more than can be explained by the rain landing directly on the lagoon flood plain. Man has built up banks on the perimeter of the lagoon to prevent flooding to this nearby reclaimed land, now turned to residential use. The quantity of water contained within the lagoon and salinity are liable to fluctuate wildly. The flood plain covers an area of 18.5 acres. 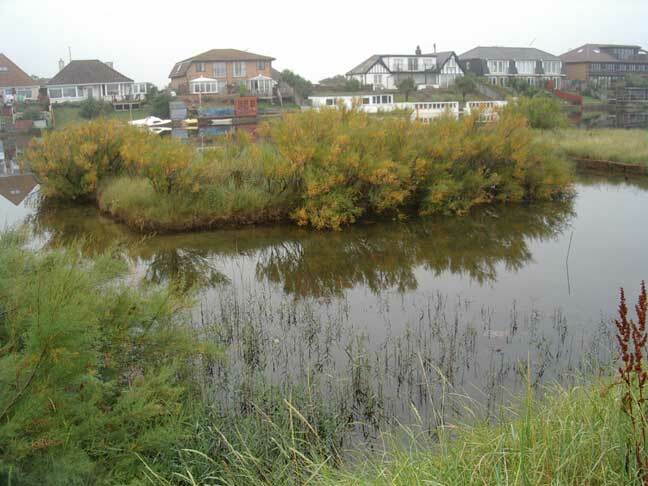 At its maximum flooding with a measurement on the gauge by the bridge giving a depth of 1.60 metres, the lagoon will cover an area of 4.6 hectares (= 11.4 acres) with a perimeter of 2282 metres. 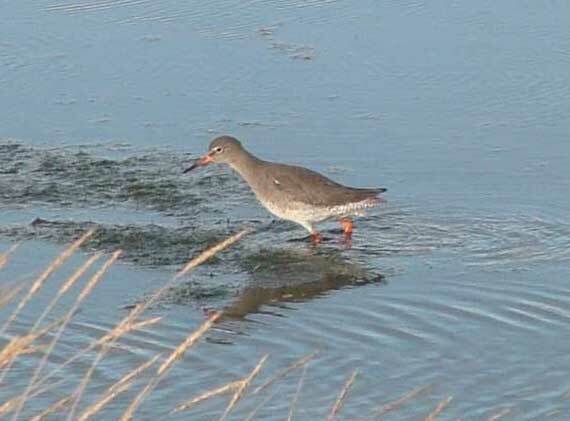 The Redshank is called the "Sentinel of the Marshes" because it is the first bird to all out a warning at the approach of danger. For this reason Ray Hamblett did well to get close to this Redshank feeding in the shallows of Widewater Lagoon. 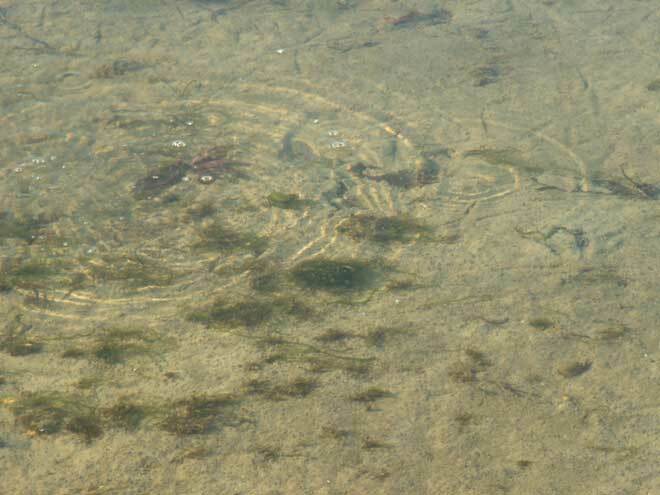 On the high (5.49 metres WX Tides at Shoreham Harbour) tide in the early afternoon (about 2:00 pm) the water bubbled up through the floor of Widewater Lagoon sending circular ripples over the surface of the clear water. 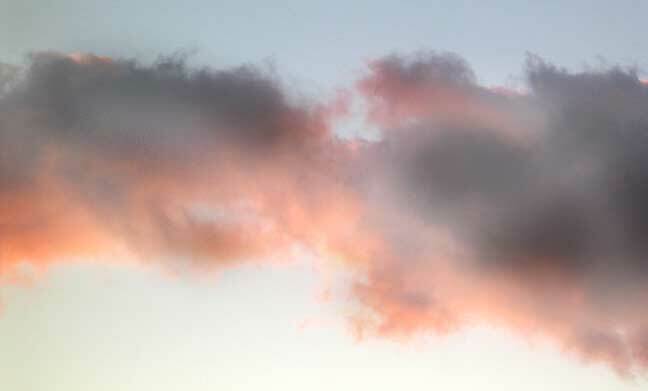 The Sun was low in the sky giving a yellow cast. The Little Egret was actively fishing snapping at small prey, probably the prawns, although none were actually seen in the shallow water. 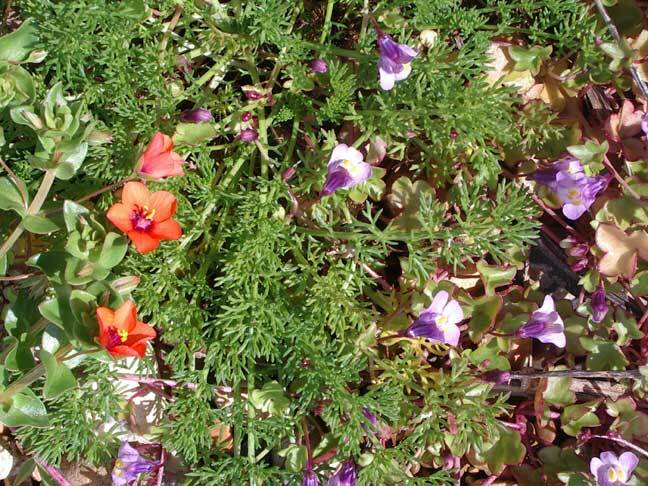 Any signs of flowers in December in any habitat is unusual. 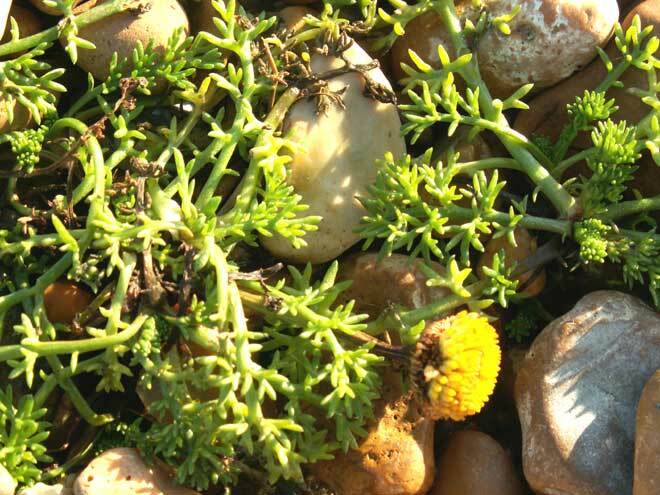 A single yellow remnant of a Mayweed flower was seen amongst the creeping green stems over the gravel flood plain. 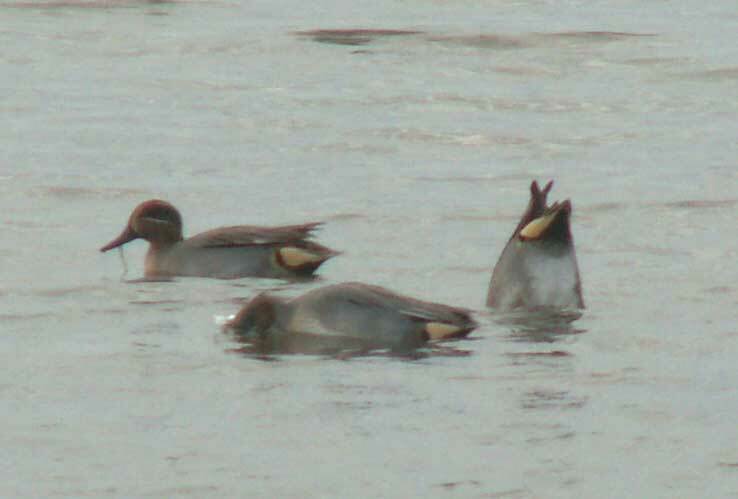 A flock of at least half a dozen Teals were feeding in their characteristic way, all upturned and rear showing, on Widewater just west of the bridge and causeway. With the usual Black-headed Gulls and Mute Swans, there were a flock of nearly a hundred Dunlins, three Little Egrets, one Oystercatcher, at least two Redshanks and probably five or more, and one Turnstone was seen camouflaged trotting along at the water's edge over pebbles (lower down the shore than a patch of purple Glasswort). A Kingfisher was seen at the western end of Widewater Lagoon. Just after midday there were three Little Egrets seen on Widewater, but no Cormorants. 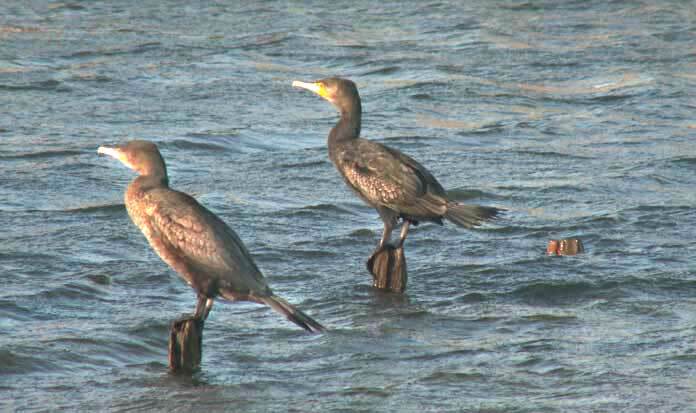 There were fourteen Cormorants seen on Widewater including one actively diving under the water on the flooded lagoon. There was a chirm of just four Goldfinches in the remnants of vegetation between the lagoon and the shore. Another Grey Phalarope was seen and photographed at the western end of Widewater Lagoon, Lancing until early afternoon when it flew off. Also two Black Redstarts and a late Wheatear on the beach. There were at least eleven Cormorants and two Little Egrets on a flooded (1.64 metres) Widewater. I do not think this represents a population increase but a movement of the 29 birds that are usually to be found on the beach a mile to the west on the beach by Brooklands. The immature birds had white bellies. Seven Cormorants were perched on poles in Widewater Lagoon east of the bridge, but flew to the west of the bridge when disturbed. 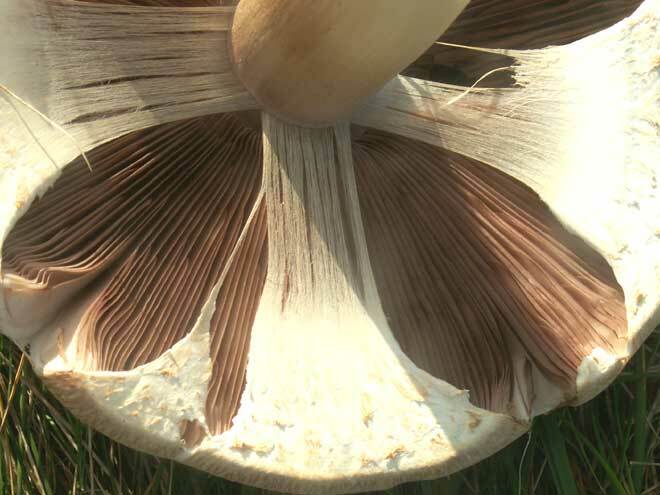 The six large mushrooms (illustrated above) grew in the grass between Widewater Lagoon and the sea, east of the bridge. They had already been broken off before I photographed them. The cap diameter of the largest specimen was roughly measured at about 15 cm with a height of an estimated 15 cm. 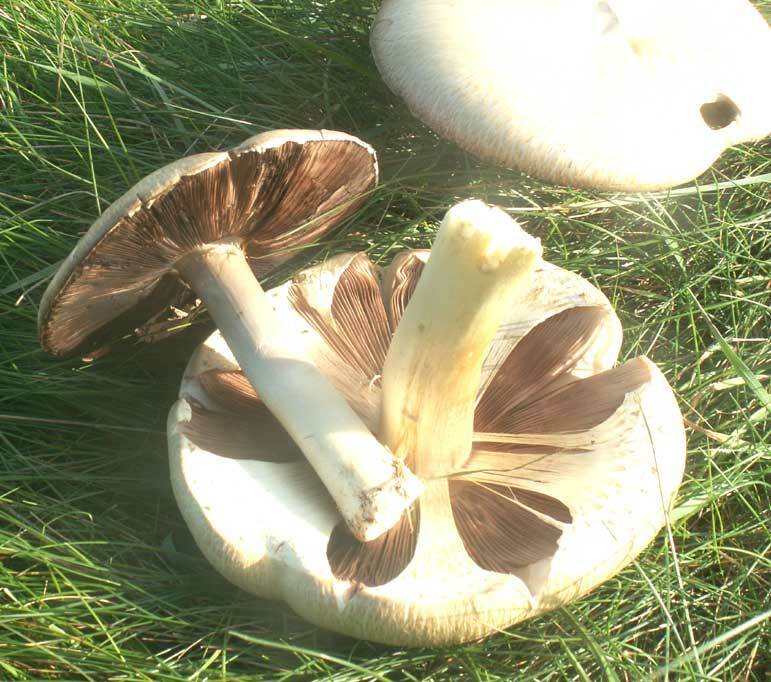 This looks like one of the Agaricus species (a genus that includes many edible mushrooms). Four Little Egrets actively fished in the shallows of the flooded lagoon, with one Cormorant seen diving underneath the surface, another flying at low level and two perched on the seaward pole of the pipeline. Six Cormorants, four Little Egrets and one Grey Heronwere all seen fishing in the lagoon. At least one 3-spined Stickleback was seen in the shallows of the flooded lagoon. There were a few small prawns, but not the hundreds that are often seen. 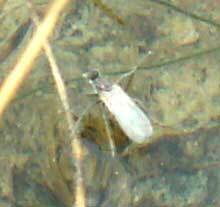 There was what appeared to be a handful of small midges (Chironomidae) skating on the shallows near the Tamarisk east of the bridge. These midges could be Clunio marinus. Over dry land there was a male Common Blue Butterfly. The unmistakable white rump of the Wheatear was just confirmation of at least three birds by Widewater about to embark on their long migration south for the winter. The lagoon was in flood with very little bird life, except for the Mute Swans and the four cygnets. 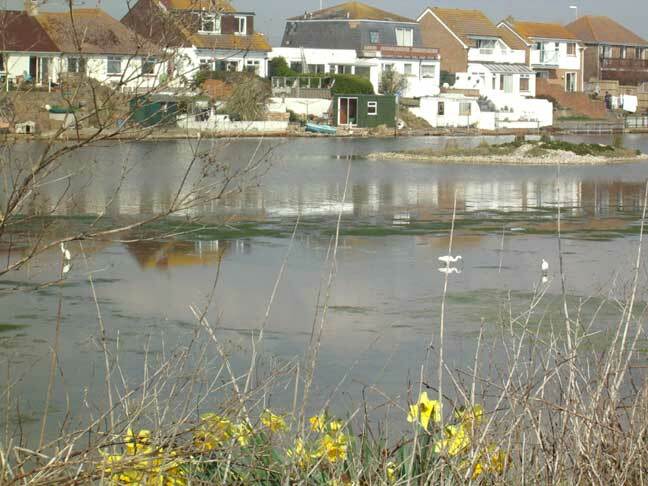 The lagoon was in flood after the recent high tides registering 1.64 metres on the gauge and was still like a mill pond. The water itself was discoloured slightly black, probably from the sediment churned up in the breezes and soil washed in during the rain in the last two days. 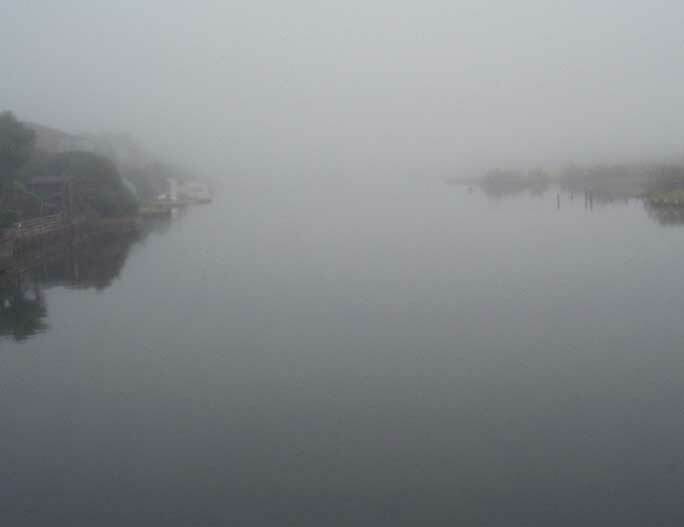 Around midday the lagoon was covered in mist so the flats at the east end where completely obscured when viewed from the bridge. The air temperature at the time was 18.8° C with a humidity of 92%. The Mute Swans still had four cygnets and at least one Little Egret was fishing. 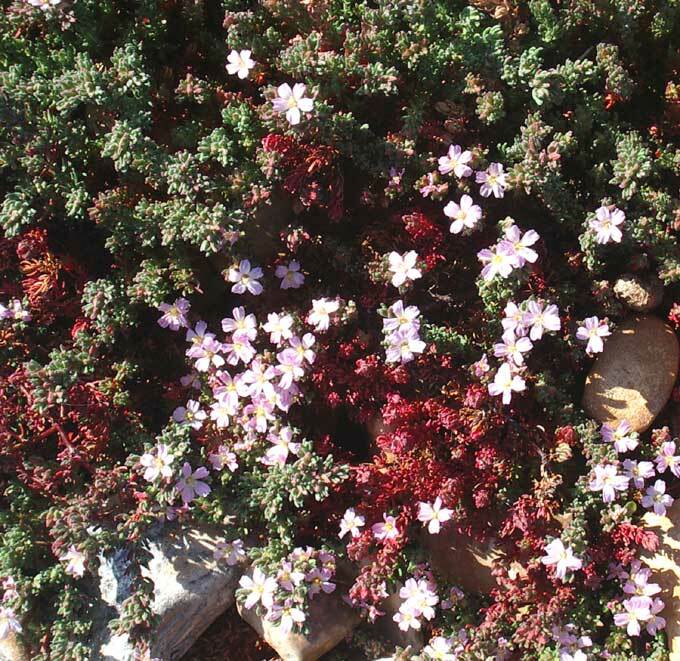 The first photograph from the left shows the Tamarisk on a small island and the two central images contain plants to be identified. Four cygnets are observed with their Mute Swan parents on Widewater Lagoon. 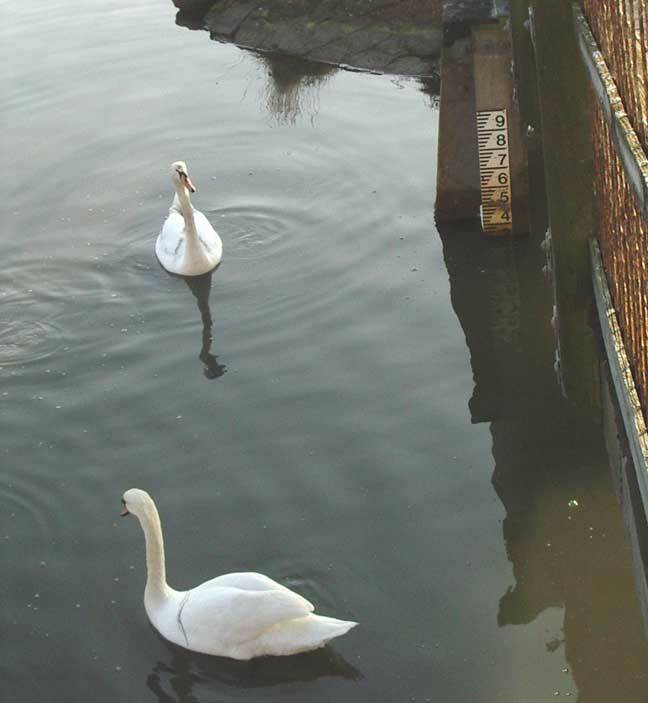 The previous offspring of seven and six cygnets respectively all perished earlier in the year. 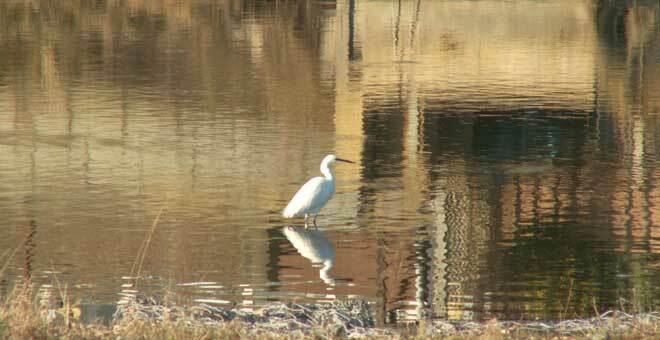 At least two Little Egrets were feeding in the flooded lagoon. The lagoon was flooded again and all the muddy margins were covered with water. As it had not rained the water must have come in either through the pipeline or percolated through the shingle floor of the lagoon. 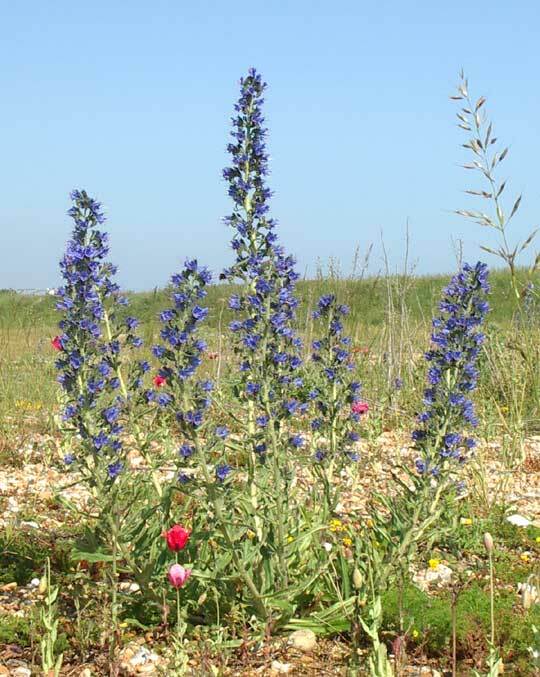 Viper's Bugloss and Yellow-horned Poppy were in splendid flower mostly between the concrete path and the wooden fences preventing the shingle beach from spilling over the path by the gales. Shore Crabs, Carcinus maenas, were observed dying in isolated pools in Widewater Lagoon. The lagoon level showed plenty of mud with the tide level down to 1.3 metres on the gauge. The water was brownish-orange in colour and there was no immediate observation of thousands of prawns. Stonecrops, Sea Heath, Bird's Foot Trefoil, Ivy-leaved Toadflax, Viper's Bugloss, Opium Poppy, Sea Kale and Sea Campion were prominent. 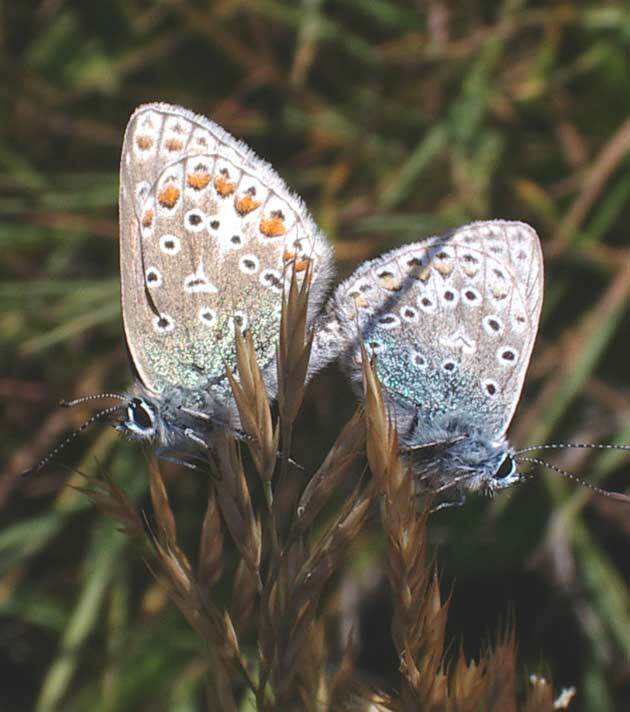 There was a mating pair of Common Blue Butterflies on a long grass. 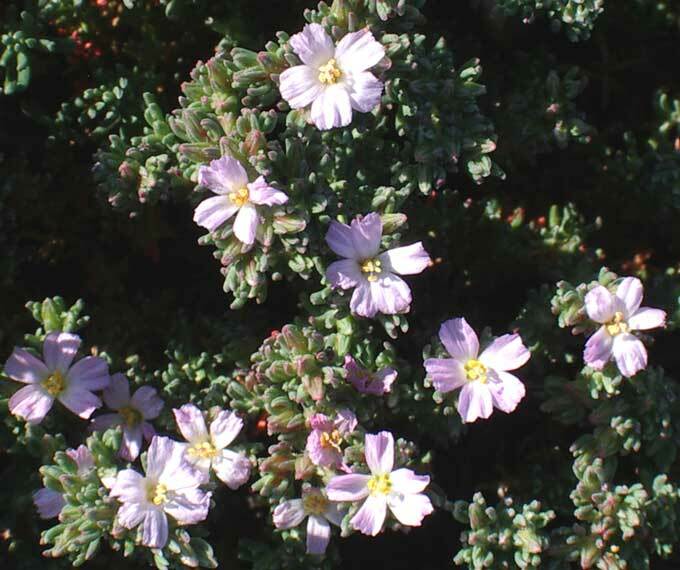 Sea Heath, Frankenia laevis, & Lesser Sea-spurrey, Spergularia marina. 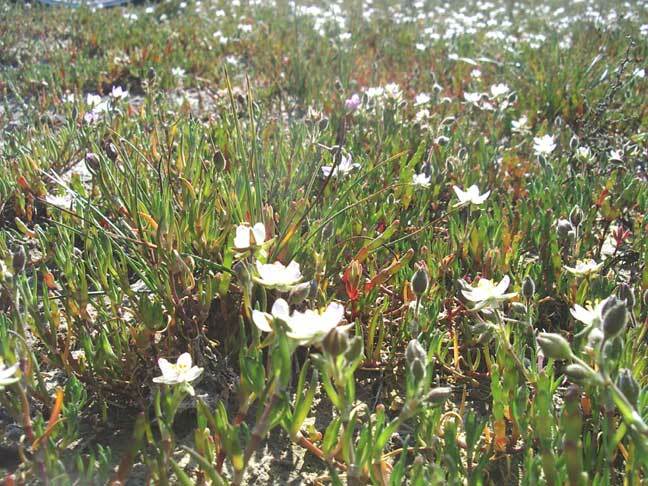 The flood plain revealed Glasswort still in a zone before the mud with a salt marsh grass and a plant with small white-mauve five petalled flowers (image on the right, above) which I have identified as the Lesser Sea-spurrey, Spergularia marina. There were plenty of muddy margins on the receding lagoon on the neap tides. Even the Little Egrets were absent on a passage visit. Bird's Foot Trefoil was looking colourful on the Widewater flood plain and Yellow-horned Poppy between the concrete path and the wooden fence that borders the pebbled beach. A very small blue butterfly fluttered over near the Church of the Good Shepherd. It was most likely a Common Blue Butterfly. 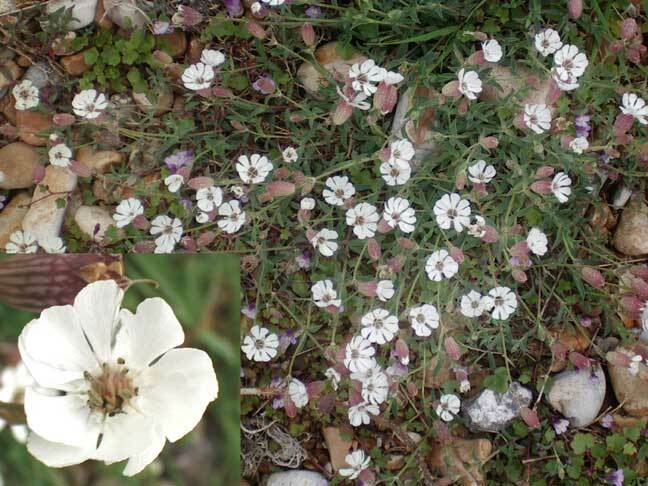 I noticed both the occasional taller White Campion near the concrete path and the very common ground-hugging Sea Campion on the flood plain. 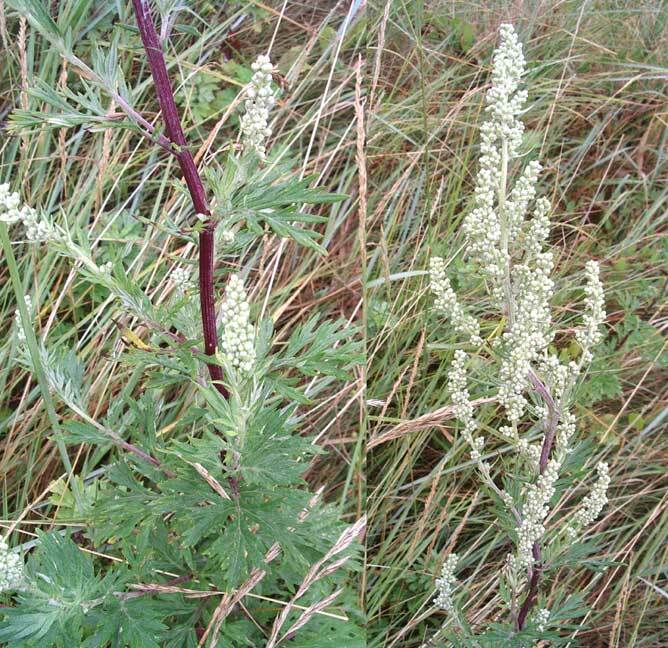 Tree Mallow was in flower but this is on the beach margins at the extreme western end of Widewater near the Sailing Club. There does not seem to be any new growths of Tree Mallow. There were five Little Egrets fishing in a flooded Widewater Lagoon just before dusk (the current spring tides are over 6 metres) but I did not spot any Mute Swan cygnets (although I could have missed them). The muddy margins were all under water, which was partially covered by a green floating fluffy weed. 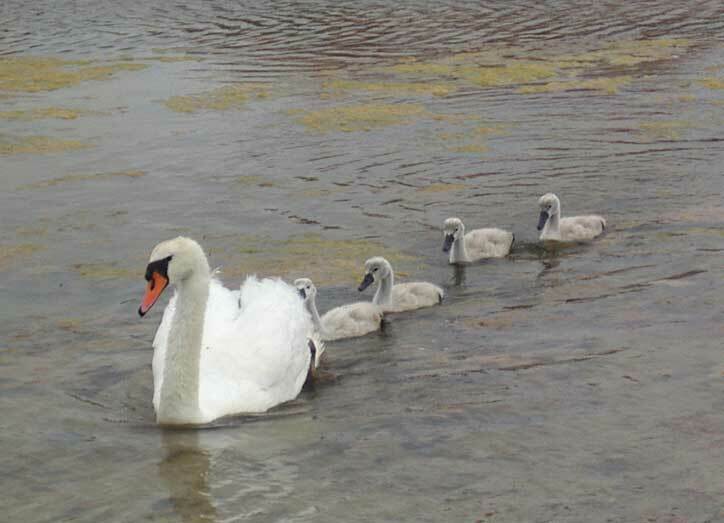 On Widewater Lagoon, the Mute Swans at the eastern end are looking after six cygnets. 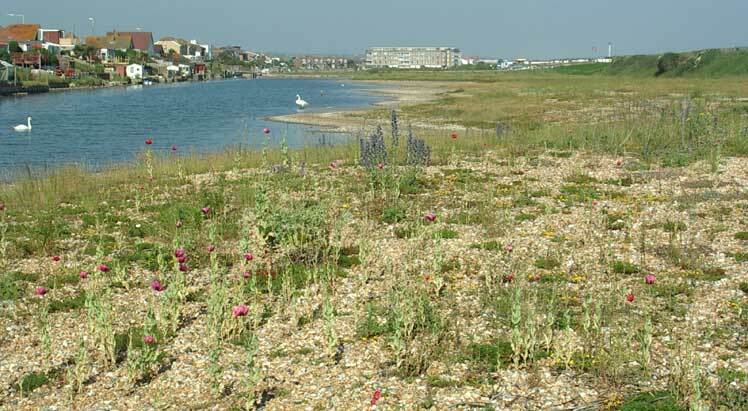 A Gull-billed Tern, Sterna nilotica, is reported from Lancing beach over Widewater. This is a rare bird in Britain and Sussex. 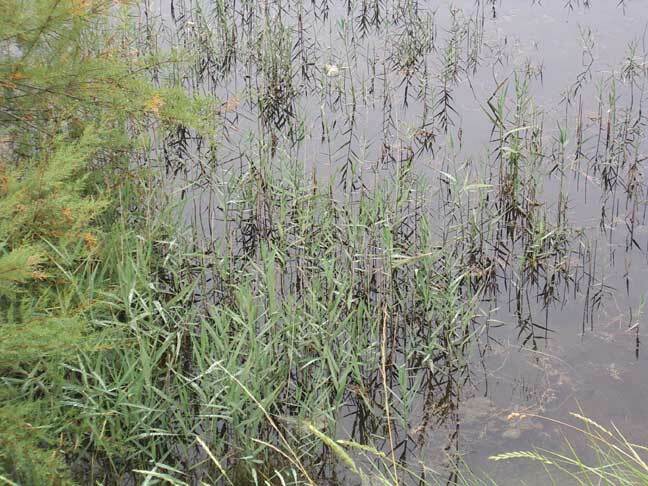 It was the neap tides cycle and the Widewater water had receded leaving the muddy margins (which may allow Glasswort to grow). Three Little Egrets were seen. One Ringed Plover demonstrated its distraction display on the gravel near the pipes on which the wild plants (e.g. 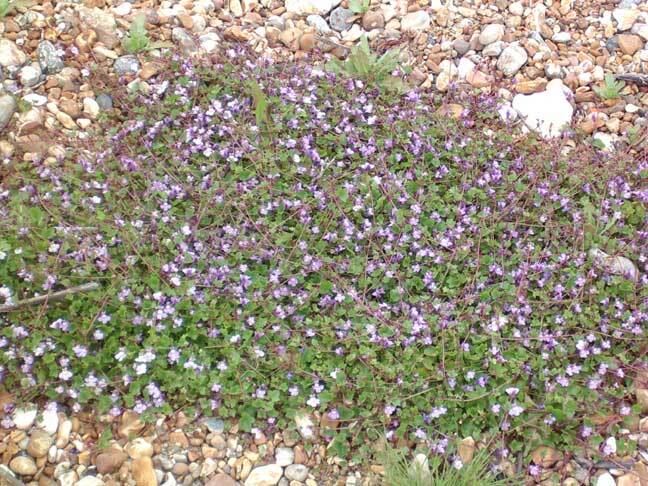 Thrift, Ivy-leaved Toadflax, Sea Campion, Bulbous Buttercup) flowered amongst the Stonecrops. Two adult Mute Swans are seen guarding their seven cygnets on Widewater Lagoon. 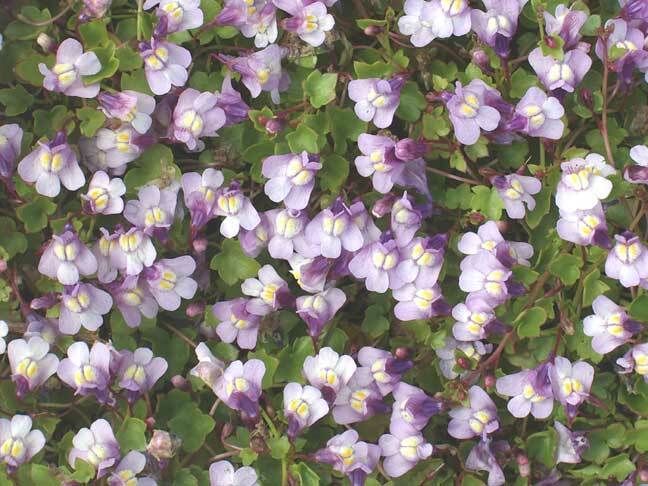 Thrift was now flowering amongst the Ivy-leaved Toadflax, which seemed much more extensive this year. 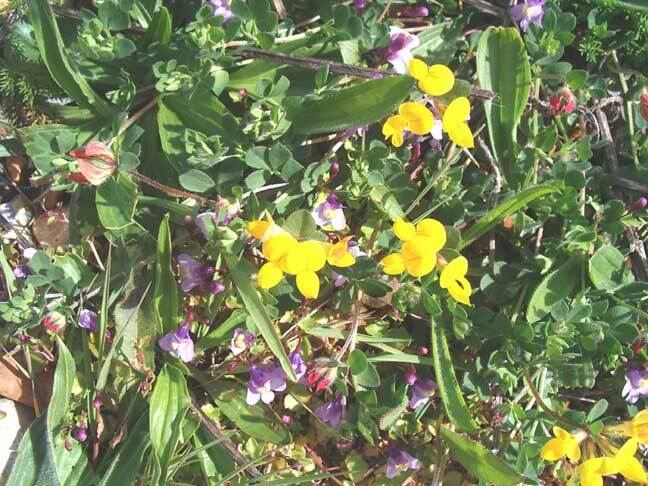 The first yellow of the a occasional patches of Bird's Foot Trefoil began to appear. Despite the neap tides, Widewater was still in flood providing a home for at least 23 Mute Swans and at least two Little Egrets. If this depth of water is maintained the new growths of Glasswort would be impeded. 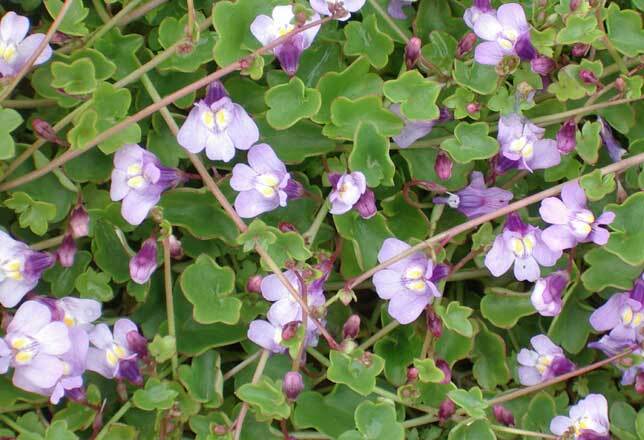 The gravel and pebble verges near the pipeline were covered in Ivy-leaved Toadflax with clumps of Sea Campion and Sea Kale. 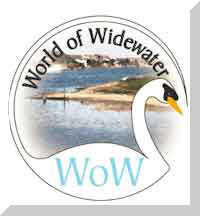 On the sea by Widewater, there were two Great Crested Grebes and two Sandwich Terns were flying over the sea and diving. Immigrant Wheatears were on the grass by the brackish water lagoon. There were four Little Egrets, at least one very actively feeding, stabbing at prey in the flooded lagoon. Both the Little Egret and the single Turnstone were disturbed in the photograph above. 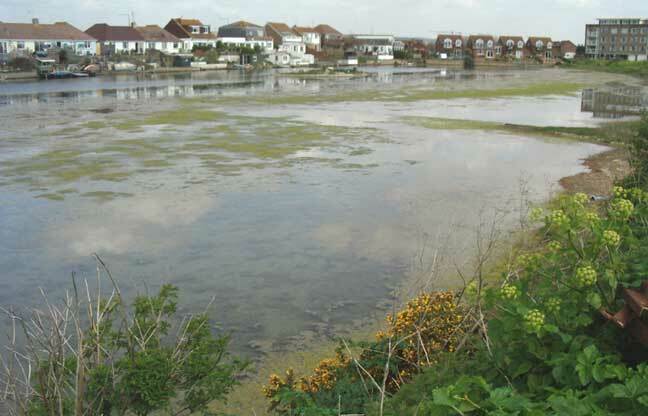 Despite the neap tides, Widewater was still extensively flooded with most of the Glasswort muddy margins submerged at a gauge reading of 1.47 metres. With thousands of prawns this was an ideal feeding ground for four or five regular Little Egrets. Five Little Egrets fished in the flooded lagoon (1.59 metres). One Little Egret caught and swallowed what, because of the flash of silver, looked like a small fish. 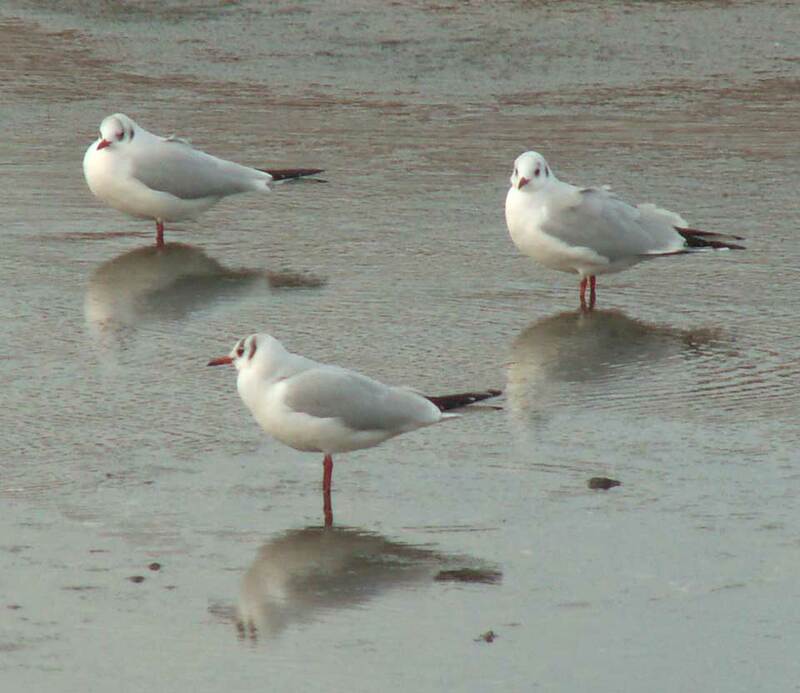 Two Turnstones (in winter livery) patrolled the shallows. The salinity near the bridge was 33.1‰. The new draft Management Plan is in the process of being drawn up. I cannot see any problems as nature has got the upper hand over any changes that the operation of the pipeline can make. Three Little Egrets fed energetically and frequently (up to every 15 seconds), probably gobbling up small prawns, in the shallows of the flooded Widewater Lagoon. The yellow in the foreground are Daffodils. Widewater was as still as a millpond apart from the torrents of seawater gushing through the pipelines on the equinoctial spring tide and the seawater bubbling through the shingle bank (the bubbles could be seen on the surface of the lagoon) through the lagoon mud substrate. The depth gauge registered a high 1 metre 60 cm. There was no moving life like the small prawns to be seen in the clear water. Mallards landed on the surface and a Little Egret probed around the flooded edges. There was one Brent Goose on Widewater. There was a Stonechat in the bushes around Widewater and a Little Grebe on the lagoon. The lagoon level had dropped to one of the lowest since the pipeline was installed. The gauge read 1.36 cm (above Chart Datum?). The explanation was a lack of rain in January. 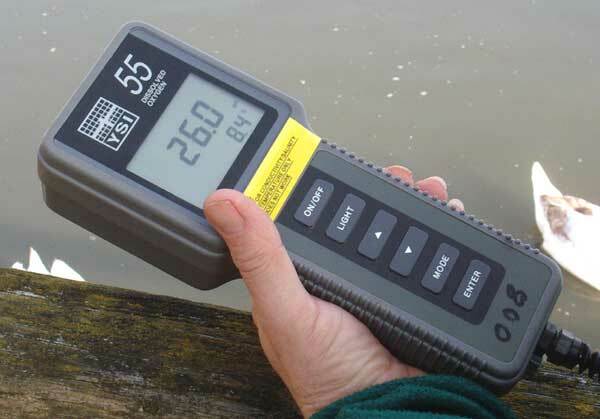 Salinity is now measured by John Knight of West Sussex County Council using an electronic meter that recorded 26‰. 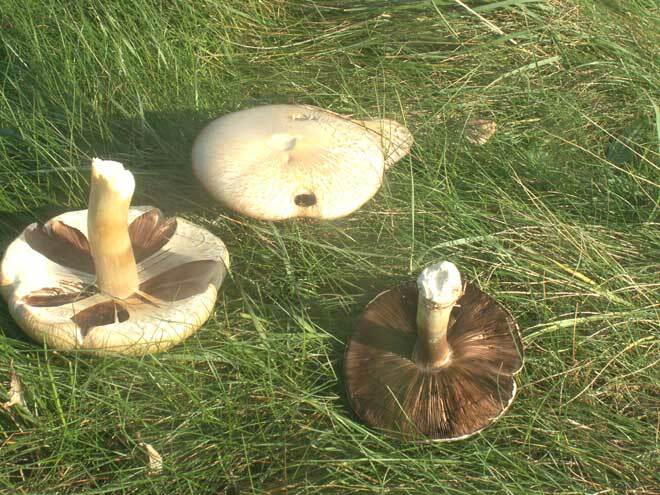 There was a large mushroom with a 30 cm diameter on the grassland to the east of the bridge over Widewater Lagoon. Unfortunately it had been broken up. It looked like an unattractive specimen of an Agrocybe. At least two Redshanks and two Little Egrets were actively feeding in the shallows. 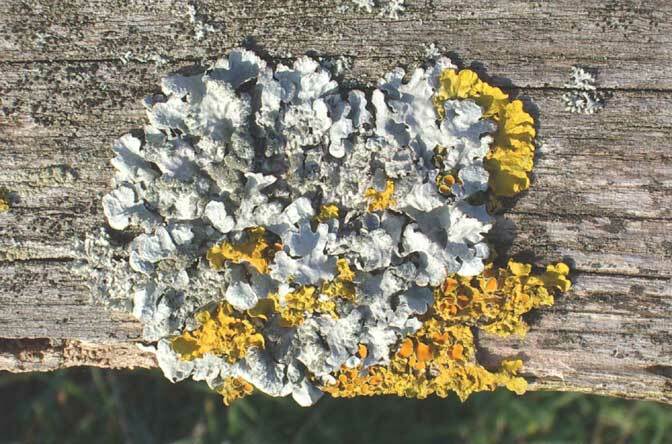 Lichens grew on wooden fences, there was plenty of niches for epixylic organisms despite the paucity of trees on the beach. .